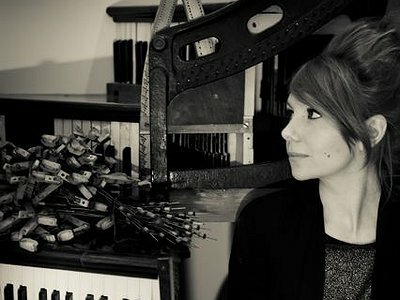 Poppy Ackroyd's debut album Escapement was created using only the piano and the violin, it was self-recorded with the help of a laptop, a microphone and a discarded old grand piano. Her music is likened to Nils Frahm and Max Richter, she's been labelled a virtuoso and her music intellectual, but none of that seems to matter when you hear her music. The Edinburgh-based performer and composer grew tired of expressing the thoughts and feelings of composers from another time and another place, and wanted to represent what is happening here and now. Ackroyd's music creates a lucid world of sound and meaning using a combination of traditional playing and the more explorative techniques of plucks, taps, hits and scrapes. Having recorded and toured with the Hidden Orchestra, Ackroyd continues to compose and perform soundtracks to live theatre and dance and collaborate with other musicians, artists, filmmakers and producers. I started seriously writing music a few years ago when I got asked to compose soundtracks for a solo dance piece and an animation around the same time. The sound world I really wanted to create became apparent then, and I realised that in order to make it a reality, I would have to learn how to produce music myself. When I first started performing more contemporary classical music things really changed for me. I loved the new textures and techniques that I was using, the piano suddenly became a whole new instrument. When I first saw the drummer Thomas Stronen live I was amazed by the effortless use of electronics in his performance and his perfect technique. It made me realise what was possible in a live show and what could potentially be done with only one instrument. Compositionally I am mostly challenged at the moment by lack of time. I am constantly inspired but I struggle to find a few free days to really get involved in an idea. I am constantly challenged by music production. I was on a very fast learning curve for the album, it took a lot of hard work. Each track is a bit different. Sometimes a melody will come to me from nowhere and I will start with that but usually I am inspired by something in particular and then I will sit at the piano and try and channel the feeling or mood I am experiencing. Sometimes the tracks are based on something more narrative and in that case I tend to work to more of an imaginary film that is playing in my head. My tracks are very composed and I also like to recreate them in the same way live. Most of the elements of the tracks though could be said to be improvised. I then take those ideas, like samples and work with them within the composition. Composition is the organisation of sound and space. No, I do not think it is important for the audience to be able to hear the process of the work in the music. It is not important to the final sound, that has to stand up on its own. My work has a very clear concept behind it, the fact that every sound is made using only the violin and piano, but I hope that the work makes sense musically without knowing that. I hate when I go to a gallery and a piece of art needs a description in order that you understand it. I think if anything, I was trying to make this not transparent. Often the sounds are manipulated to sound like something else. I was trying to create a soundworld that was widely varied and didn't sound like it was made by only two instruments. We cannot help but be influenced by where we come from. I wonder if I would have made different music if I had stayed in London and not moved to Edinburgh. Living in Scotland, the folk music scene which was new to me, now means something different than it did before. It has a comforting familiar feel to it now, as part of the Scottish culture. The sound world I really wanted to create became apparent then, and I realised that in order to make it a reality, I would have to learn how to produce music myself.